For Tabletop Co-Op this month, we are taking a closer look at a recent game release. 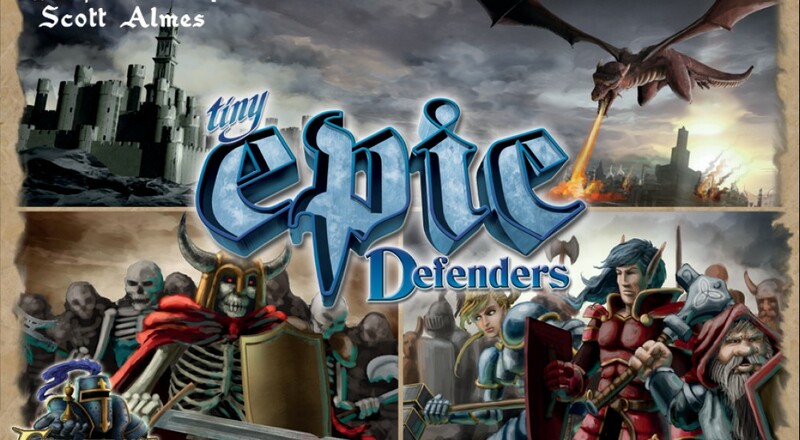 Tiny Epic Defenders packs a powerful punch and wraps it all up in a small package. It’s a great game, with fantastic monsters, brave heroes, and a kingdom to defend. Best of all, it is challenging and highly cooperative from start to finish. Tiny Epic Defenders is the second game in its line. The first, Tiny Epic Kingdoms, is a 4X game, where players expand their control of a fantasy realm. The upcoming third game in the line, Tiny Epic Galaxies, uses a dice rolling mechanic as well as programmed action to simulate players colonizing space. Tiny Epic Defenders sits between its two competitive siblings as the only cooperative game in the series. All three games are designed to have a modest component count and a short play time while still providing a deep gaming experience. At its heart, Tiny Epic Defenders shares many qualities with other, more complex cooperative games like Pandemic or Defenders of the Realm. There is a deck of cards where bad things happen, and players have limited resources and actions which they must use to mitigate these negative effects while working together towards victory. In the case of Tiny Epic Defenders, players represent heroes who team up to keep enemy threats away from a group of seven realms, each represented by oversized cards. As the endgame approaches, a boss-like Epic foe appears, and must be defeated in order to save the kingdom. One of the most innovative aspects of Tiny Epic Defenders is the composition of the decks used through the game. There are several types of cards: player action, group action, regular enemies, and dire enemies. These are sorted into three different decks as the game begins. All player and group action cards as well as a portion of the regular and dire enemies are shuffled into a turn deck. 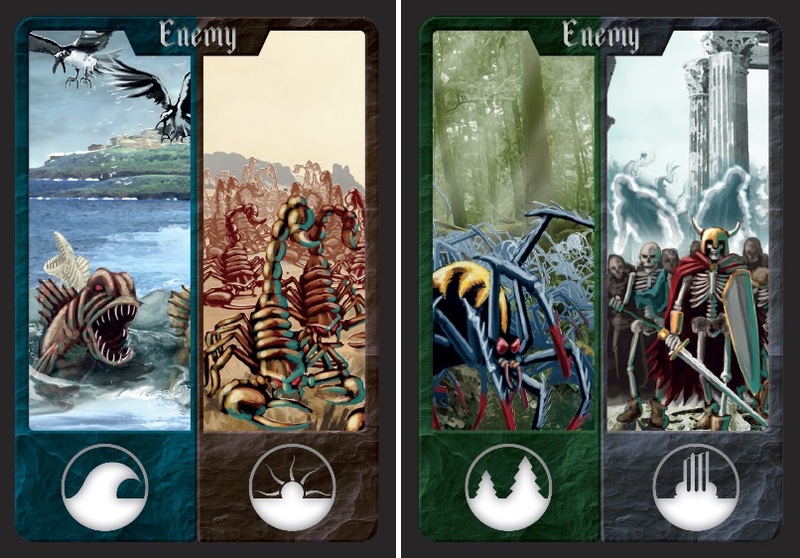 A separate horde deck contains more enemies of both varieties. When the turn deck runs out, a card from the horde deck is added to it, and the turn deck is shuffled and used again. When the last horde deck card is added to the turn deck, the oversized Epic Foe appears, and the last battle begins. This setup makes for a smoothly escalating conflict with some complex decisions to be made. Hero action cards show up often in the first few trips through the turn deck. Turns are variable in order, depending on which color action card shows up. As the game goes on, more enemies and dire enemies show up, yet the number of player actions per turn never increase. There is no level up mechanic, but the artifact deck allows for some player advancement. When dire foes are fended off, the defending player obtains an artifact, and these range from mildly useful to enormously powerful. Wise players will fight off as many dire enemies as possible, as the advantages they provide can make the difference between a close win and a blowout defeat. Page created in 0.5327 seconds.